Numsa spokesperson says she feels bad for workers who were ‘punished for their association with the Guptas’. The National Union of Metalworkers of South Africa (Numsa) is calling for nationalisation of the recently closed Afro Worldview “for the sake of employees”. Numsa spokesperson Phakamile Hlubi said the closure of the news channel owned by controversial businessman Mzwanele Manyi was a blow for unions. Hlubi said: “They [Afro Worldview] were more interested in providing a platform on workers issues. Their absence in media is sorely felt. I feel particularly bad for workers who were punished for their association with the Guptas. The channel shut down last month after satellite television company Multichoice did not renew its contract. 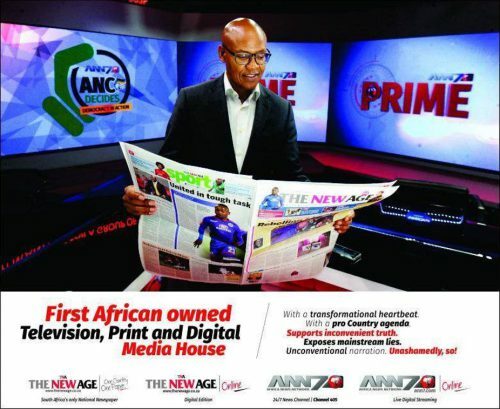 Afro Worldview’s closure came just a few weeks after Manyi’s daily newspaper, Afrovoice, formerly known as The New Age, filed for liquidation. The employees of both media houses claimed they were only told the day before the closure not to come back the following day but were promised one month’s salary. Both media companies were owned by the controversial Gupta family. Yesterday, a national treasury official testifying at the ongoing state capture inquiry revealed that the media companies received about R260 million from South African government departments between 2004 and 2018. The media platforms came under heavy scrutiny after allegations of corruption emerged against the family which has close ties to influential political leaders. Manyi admitted in court papers for liquidation that revenue deteriorated severely after the Zuma administration. He bought the channel and newspaper from the Gupta family last year.